In order to show off the company products at trade fairs and exhibitions at home and overseas a number of scale models were built. These were built by apprentices and students. The models were all working models but usually ran on compressed air, rather than steam, or were electrically driven by a concealed motor. The first model was a two cylinder compound steam engine generator set based on a design still in manufacture in the late 1950’s. This model was displayed in an engine room environment. Driven by compressed air the model generator produced electricity to light up the lamps on the control panel. This model was restored to full working condition in a new fully enclosed glass cabinet. The model is now on display in Bedford Museum and, driven now by a concealed electric motor in the plinth, can be started up by visitors pressing the white button on the front of the plinth. 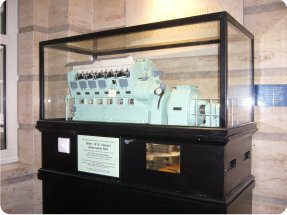 The second model was a steam turbine generator set. This model was originally intended to be driven by compressed air but it was found that with unheated air going in the exhaust filled with ice due to the expansion of the air. This model was spared the fate of the other models and did not require restoration and is now on display in the reception area of Allen Steam Turbines in Oakley. Two diesel models were built. The first was of an Allen Diesel Generating Set installed in a ships engine room environment. This model is currently being restored by students at a school in Bedford. 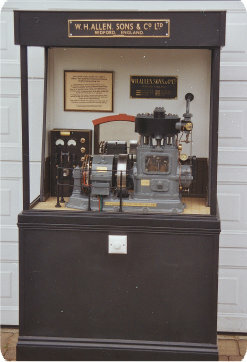 The second diesel model was an Allen V12S12 generator set. This model was driven by a concealed electric motor in the plinth. This model was rescued from the basement of the Works Managers block along with the steam engine model and has now been restored and has been passed to the Institute of Marine Engineers and is now on display in their headquarters in Moorgate in London.